After receiving her medical degree in 1983, she stayed at Johns Hopkins to complete postdoctoral training in medicine, neurology, and psychiatry. Children born today are increasingly more likely to develop a disorder that will be diagnosed as autism. The incidence has increased by as much as 20,000 percent in some populations since I began studying autism thirty years ago with Sir Michael Rutter. voted to be one of the fifty-five most influential people in San Diego in 1992 by First Thursday. Her research interests included the neuroscience of extraordinary states of human consciousness and anomalous experiences. I would have probably become a neurologist or neurosurgeon. I was a neuroscientist, and interested in the brain. Most of the other psychiatric programs were psychoanalytical at the time, which was not my orientation, but psychoanalysis is a valuable tools that I use regularly. The Department of Psychiatry at Johns Hopkins was chaired by Dr Paul McHugh, who was a neurologist before he became a psychiatrist. Our “bible” was not the Diagnostic and Statistical Manuel (DSM), which was used primarily by lawyers and insurance companies. It was a book called “The Perspectives of Psychiatry.” McHugh’s approach to psychiatric illnesses was a precursor to integrative medical approaches. We were trained to look for medical, as well as personal and social, causes of mental illness and psychological suffering. In 1987 I spent six months at the London Institute of Psychiatry with Sir Michael Rutter, who was knighted for his work on autism. Upon my return to the United States, I was told that there weren’t enough cases of autism for me to make that my specialization, so I focused on other conditions, such as Alzheimer’s Disease. Approximately ten years ago, while I was doing research on autistic savants, the CDC announced a dramatic increase in autism. The latest estimate of autism prevalence, 1 in 68 children, is up 30 percent from the 1 in 88 rate reported in 2008, which was more than double the 1 in 150 rate in 2000, and more than two hundred times the rate when I was in training. There has also been a major shift in our understanding of the causes of depression and anxiety, both of which have also increased during the course of my career. Many of these conditions are now thought to have a medical origin. In search of answers as to why these increases are happening, and how to help ameliorate symptoms, I started attending conferences whose presenters are working diligently to advance psychiatric practice to address root causes. While I was on faculty at Harvard, one of my responsibilities was to do consultations on the medical and surgical floors at Cambridge Hospital. It was in this context that I met a patient who changed my life. She had been admitted for a possible heart attack the night before, but wanted to sign out against medical advice because she claimed to be psychic. She said that she knew her test results would come back normal and that the ghosts in her room were freaking her out. Most psychiatrists would have decided that she was not competent to sign out. Instead of automatically filling out the paperwork, I sat down to talk with her. What she did next blew my mind. She told me that she was getting a strong reading about me, and asked if I minded being told. I encouraged her to go ahead. She told me that my husband was a chemist, which was true, and that he was applying for jobs in two different cities, which was also true…his interviews were that very week. She told me that we would be moving to San Diego, California, and that we would have one child, a daughter. Both of those predictions came true. She also told me several specific things about my present and past life. How was that possible? My training had taught me that people who believe in such things are mentally unstable. A theory must fit the facts. Our current theory for the brain does not take into consideration the possibility that we might have innate precognitive and telepathic abilities. Our model in neuroscience is so incomplete, it doesn’t answer the basic questions. I simply asked, how can we be so certain these things are impossible, especially when telepathy and precognition have been reported across all cultures, and throughout recorded history. This inspired me to write my first book, The ESP Enigma, which was published in 2008. I was on a whirlwind tour the first year after publishing my book. It was well received by clinicians and academicians, and was even used in one of my former colleague’s neuroscience course. It landed me a position in the LA Festival of Books as a first-time author, and found its way into many libraries, including those of universities across the country. Then the proverbial hit the fan. Less than two years later, my license was suspended on an emergency basis because a psychiatrist told my medical board that I had written a book on ESP and therefore must be psychotic. I had no history of mental health issues, and all of my colleagues and patients were outraged. I underwent extensive psychological and neurological testing, and my license was restored at the next board meeting, three months later. The psychologist’s report concluded that I was an eccentric genius who was willing to think out of the box. I could have told them that. What I wanted to know was, why was my book so threatening? Physics had undergone a revolution over a century ago which paved the way for a paradigm that would allow for such phenomena. After having my license restored, I had two goals. One was to find the most compelling evidence that I could for psychic phenomena. This is why I chose to do research with autistic savants, whose abilities are so similar to ESP that they are almost indistinguishable. I chose to work with children because they are reported as more likely to retain these abilities than adults. After making my hypothesis known that autistic children are the best candidates to exhibit telepathy, I received numerous phone calls, emails, and comments from parents at conferences that I am on to something. I have formally tested three children thus far, and am convinced that there might be something there. Over time I began to realize that the problem with acceptance of ESP is not the lack of data. It is, ironically, our incomplete model for the brain. That is why for the past three years I have turned my attention to working on a new way of thinking about the brain and its relationship to consciousness. My approach has been to look at the anatomy of the brain, including all of its subcellular components, the way that an engineer would if they stumbled across a device from a foreign culture and were trying to understand its function. Instead of ignoring anomalous phenomena such as precognition, telepathy, clairvoyance, and out of body experiences, I wondered if there is a model that could explain all of these. It turns out that there is. My proposed model will be the topic of my next book, which is tentatively titled: Misunderstood. who had helped Native Americans, a tradition that continued as recently as my grandfather and Great Uncle Ammon Hennacy. The tradition of helping Native Americans began with my eighth great grandmother, Elizabeth Fones, and my eighth great grandfather William Hallett. As a little girl, I also found myself attracted to South East Asian cultures, and in particular Tibetan and Indian art. When we moved from New Jersey to Ohio in the mid 1960’s, most of our belongings were destroyed when the moving van was in an accident. As a result, I only have a few things from my early childhood, those which I took personally with me in the plane. Two of them were from India… a bell and a lantern. The other was a statue of a springer spaniel. While I was living in San Diego, I became a member of two societies that were trying to help Tibetans. It was at one of these meetings that I met the clinical psychologist for Survivors of Torture International and agreed to help them develop a psychiatry program. In 1997 I went to India for the first time at the invitation of Pat Cook, a musical therapist who had written a book about music therapy, and had compiled a collection of recordings from indigenous people who use sound for healing. The trip transformed my life. 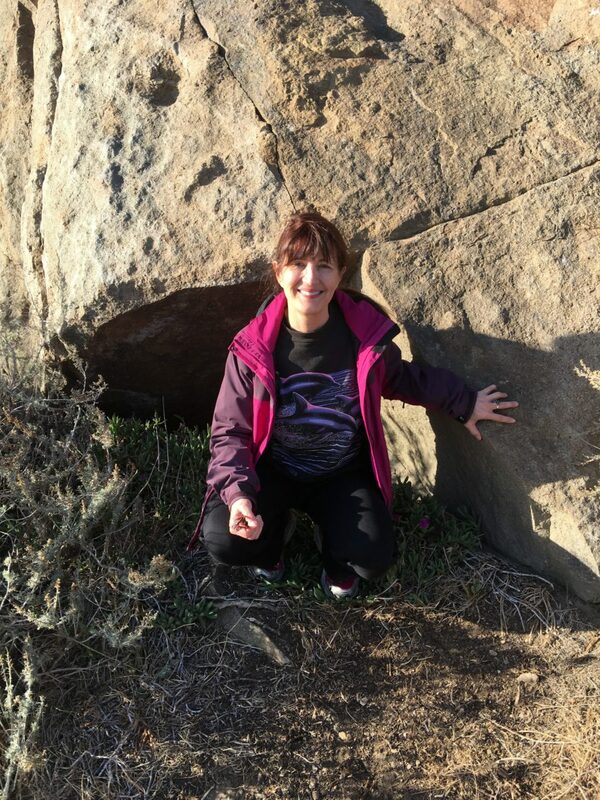 We went to her favorite sacred sites, and experienced firsthand the power of how sound can be used for healing. Upon my return, I had a series of profound dreams. Let’s fast forward to Oregon, where I moved in 2003. Shortly afterwards, I met a woman who is considered a National Treasure by India, because she had spontaneously started speaking Sanskrit, without any exposure. She is reportedly very psychic, and had become a guru to many people. In one of our meetings, she told me that I was a Tulku, which didn’t mean anything to me. She said that a Tulku was a Bodhisattva, and that one day I would meet someone connected with the Dalai Lama and find out that this is my path. I could relate to the concept of Bodhisattva only in that I have been trying to help relieve suffering as a principle action ever since I can remember. On August 21, 2017, a total solar eclipse travelled across our country, beginning with Oregon. I was invited by three friends to witness this magnificent event, but remained behind where it was only 97% totality out of concern that I could miss my flight to Arizona for an important meeting… the founding of a new science academy…The Academy for Advancement in Post-Materialist Sciences. While in Tucson, Arizona I was interviewed for a documentary about the new academy. Michel Pascal, the filmmaker for the documentary, stopped filming midway. Something about what I had to say, and how I said it, made him comment. He told me that he had spent ten years in a Tibetan Buddhist monastery, and he thought I was a reincarnated Tibetan monk. I responded with curiosity, and told him of my having been told that I might be a Tulku. He recommended going to Nepal to see if this was indeed true. I agreed, and we will be filming my trip, which will commence in December 2018. The following day, I met a Native American medicine man and paleontologist. He has been using the archives of interviews by J. P. Harrington with elders from over a century ago. Their voices and beliefs were meticulously recorded, and are enabling us to learn as much as possible about their religion as it was practiced then. This collection is giving us insight into one of the most intact indigenous religions, and is providing major clues to the root of all religions. We are working on a book about this knowledge which is tentatively titled: Signs from Heaven. I feel honored to have been initiated into this religion, and had my naming ceremony In April 2018. My Native name means “Raven.” The very next morning after being given my name, a male raven appeared on the ground in front of my friend and I while we were eating breakfast. He started dancing, bobbing up and down, and raising his legs up high, displaying moves like a feathered Michael Jackson. Then a female flew down and joined him. She started bobbing up and down, and raising her legs up high in what was obviously a mating dance. They moved in a circle, facing each other, and dancing for around ten minutes. They then walked down the road in front of us, side by side, bobbing the whole way. One of 13 ancient volcanic domes or plugs, and the last of the “Nine Sisters” that run from San Luis Obispo offshore in Morro Bay. It is considered a very sacred place by Native Americans. Academy for Advancement in Post-materialist Sciences (AAPS). 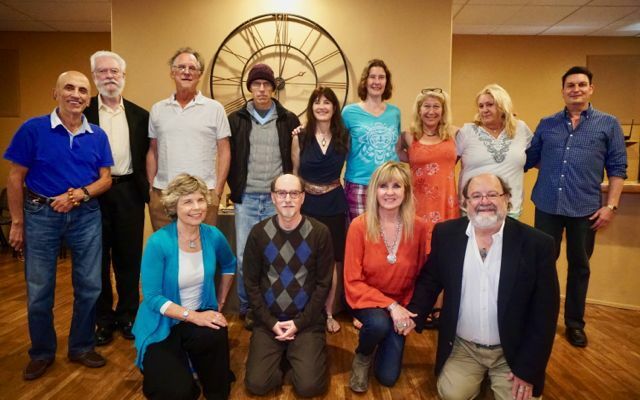 From left to right in the back row: Menas Kafatos, Ed Close, Stephan Schwartz, Imants Baruss, Diane Powell, Julia Mossbridge, Lisa Miller, and Mario Beauregard. The front row: Marjorie Woolacott, Dean Radin, and Rhonda and Gary Schwartz. Ramses’ aunt. 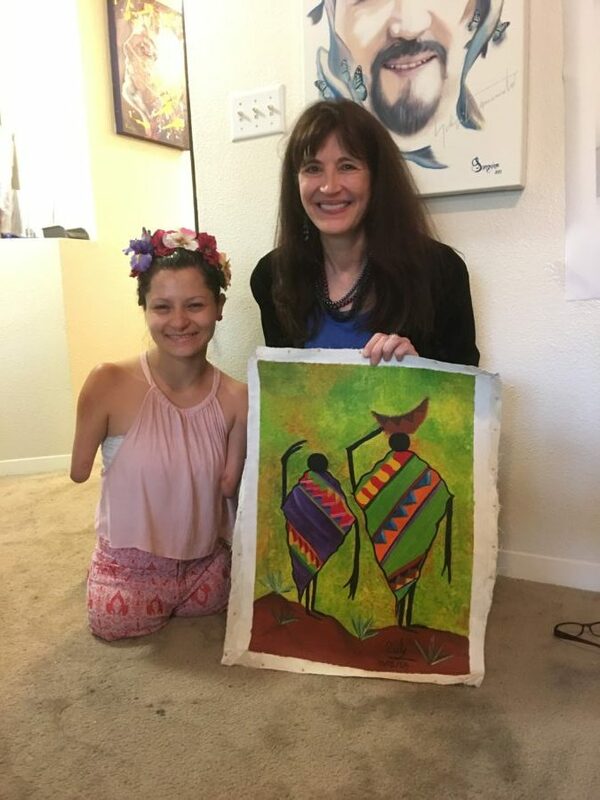 Zuly is an artist who learned to paint with her mouth at age four, a motivational speaker, and an advocate for people with disabilities. 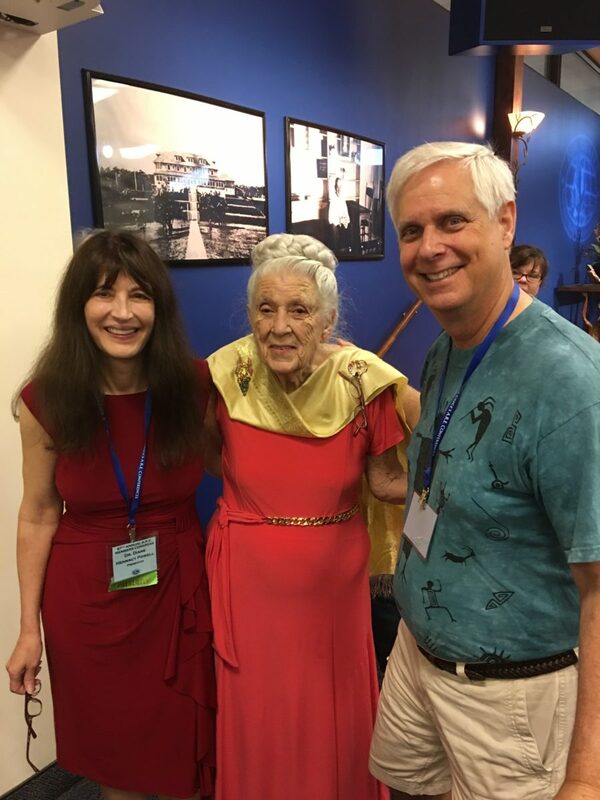 Dr Diane met Dr Gladys McGarey, the Mother of Holistic Medicine, and her son. 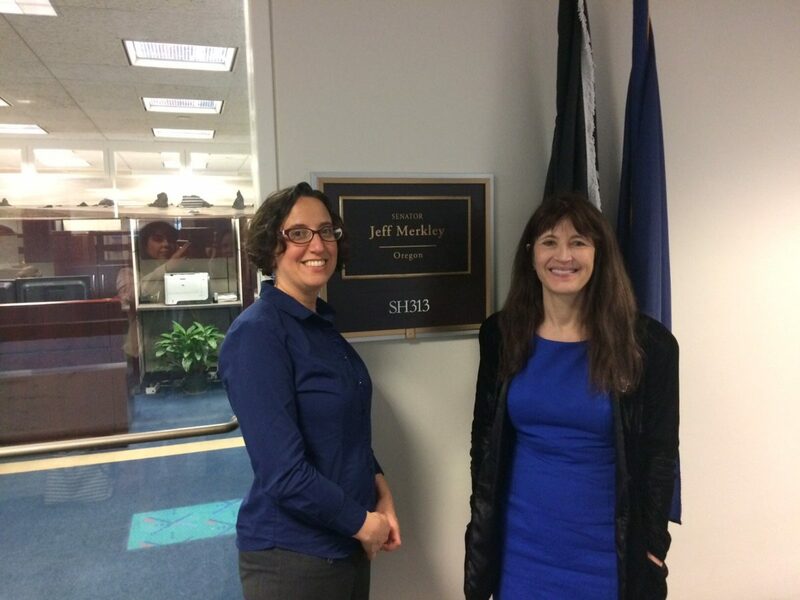 award-winning science journalist and Fulbright grantee, in Washington DC to speak with their representatives about issues related to children’s health.